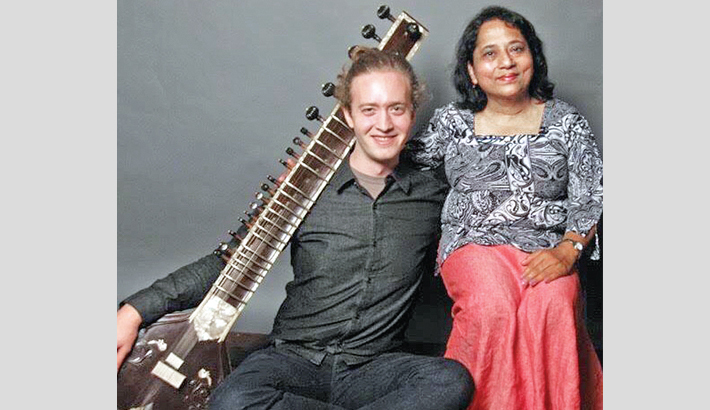 Sitarist Galen Passen with the author. Caught in the mystery of the eastern music, swayed by the melody of sitar, Galen Passen went to Delhi, India. He trained in the sitar for eight years under his Guru Gopal Krishan Shah. I had the good fortune to meet the amazing musician in my home town of Amherst during a live performance. Born and brought up in upstate New York, Galen played the delicate instrument with passion, and gradually carrying the melody to ecstasy held the audience in a trance. Catching up with Galen, I had the good fortune to catch up on his bold venture into the musical world of the east. 1: How did you come across sitar? When I was 15 years old I met a friend of a mentor (academic) of mine who had a sitar. He did not understand Raga music and as far as I knew did not have any interest in learning it or travelling to India, etc. He was just interested in experimenting with a new instrument. That was my first introduction to the instrument and obviously it made a very strong impression on me. 2. How would you compare a violin, which you played earlier, to a sitar? This is a difficult question to answer because I was learning such different types of music on the two instruments. This is a huge factor in what really defines the relationship to the instrument in my opinion. Both instruments have their own challenges and beautiful qualities and I will say that physically, sitar is far more demanding. Overall however, I would prefer to answer the question in terms of how learning western music differed from Hindustani, I will try to keep it concise! In terms of the training process I was given lots of songs and bits of music theory much sooner with violin. It was a musical culture that encouraged more playing in front of people through student recitals and building a repertoire of songs and later classical concertos, etc. With sitar, and especially through Guru-Shishya Parampara, you focus a lot in the beginning just working on the physical techniques. I remember lots of scales and rhythmic exercises but not a lot of talk about Raag in the beginning. Like with the violin, this was a process of developing a foundation. My hypothesis is that because Hindustani music is an improvised art form they are more concerned with first giving you the medium to create the melodies than what those melodies actually are. Then when it comes time to really go deep into the theory your hands and mind are prepared for it. 3. As a listener I was transported to another land by your music. How would you describe your creative world when you are playing? Unlike other forms of artistic expression where I feel like I am the source of creation, with ragas I feel that there is this great big world and it is my job to go explore it with the melodies. So for me, the experience of playing is very similar to what your question hints at, another land to find and hopefully render to an audience. It is almost like trying to remember something deep inside me that I’ve forgotten or go to a place I have dreamt of or something like that. 4. There are different raagas to accentuate your music, is there a particular one that you like the most? Each raga itself contains such a vast new world to explore, understand, and experience so it is difficult at my amateur level to make any definitive statements. That being said, I will say that ‘Mian ki Todi’ has always stayed with me as a grounding force to come back to. That is the only one that seems to have a permanent place in my heart, otherwise I go through many phases of interest. Nowadays I have also been quite transfixed by ‘Raaga Malkauns and Raaga Kafi’, particularly in the thumri style of presentation. 5. Why did you train under a Guru and not attend a regular school of music in India? When I first moved to Delhi I had an expectation that my main training would come from a University (I was first enrolled at Delhi University but left after 3 months) and that might be supplemented by a private teacher. This was my general understanding of studying music at a University in the west. However once I arrived I realised that this is not the case. I was dismayed to find a lack of academic, creative and even musical substance in the university environment. It seemed that many people saw it as a kind of formality in order to attain a degree but many students didn’t even want to become musicians. Many people were not coming to classes, even the professors. Needless to say it soon became clear that it was not (and is not in my opinion) possible to learn this music without a guru. 6. Did you find India and new skill learning as daunting at any part of your time spent there? For a great deal of the time it was very daunting, especially in the beginning. I was only 18 when I moved to Delhi so I had never really gone out on my own, even I had never lived in a city before. Everything felt new and hard to understand and I felt pretty stupid for a lot of the time in the beginning. If I remember correctly it was two or three months before I didn’t wake up everyday with some tinge of panic in my mind and I would say a couple of years before I felt at home and really enjoyed life there. And then it was really wonderful for some time. But of course, I wouldn’t give up those difficult experiences for anything. 7. Were you struck by the differences of eastern life styles which must have been a bit of life, if not all? What stuck you most? Yes, absolutely. I think there is a sense of community in India that we don’t have here in the United States. Even every day things like calling folks on the street bhaiya, didi, auntie and uncle, and the small relationships that can be created with the individual vendors in your local market. I loved that like anything and was very sad without it when I recently went to Price Chopper to buy my groceries. Interestingly though what I would say that what struck me the most was the prevalence of western commercialism and its mix with the Indian culture. I was saddened to see that the material allure of capitalism has started to really push back some of the beauty of Indian traditions and culture. 8. How enthusiastic are music lovers in the USA about the sitar? People often love it very much; they are fascinated much as I was when I first saw one. However it is rarer to find people who are interested in learning more about it. That being said there is a beautiful Hindustani music community that has been developing in New York City comprised of many Indians and non-Indians, all very hard working musicians. 9. How do you think can we draw people to the charm of Indian music, the sitar in particular? Do you plan to go back to India in the future? I think the secret lies in presenting it in a way that western audiences can understand and appreciate. I have seen many workshops given by Indian maestros and their explanations are very beautiful but I think I can only say that because of my experiences in India. There is often a lot of poetic language used to speak about the beauty of Indian music and those don’t always translate very well. In the west we have a much more analytical way of thinking and want more pragmatic explanations. I always struggle with what to say in performances because I think it is very important. On another note – and in truth this may not draw people in necessarily – I believe it is important to start speaking about this music without relying on the orientalist and sometimes racist language that has become commonplace within western “new age” culture. There is a huge amount of erasure and misinformation in the yoga, kirtan and eastern spirituality circles in this country. And there are also people who are doing a great job. As a white sitarist it is really important to me to give context about this music to allow people to start seeing it for what it is rather than the exotic commodity it has become. I don’t know yet if I am doing a good job of that. And for your last question I hope dearly to go back to India but for now I will have to wait for when it will be financially feasible to go. In many ways I feel like I grew up in Delhi, and there is a heaviness not being able to be there these days.